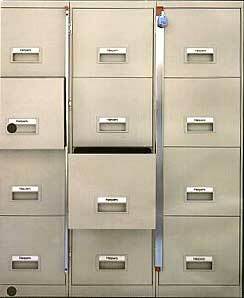 Locking bars for securing file cabinets. Choose for 1,2,3,4 and 5 drawer file cabinets. 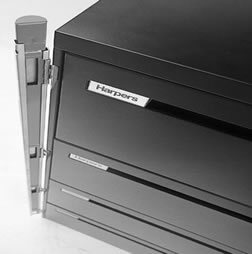 Our multi lock bars securely locks all the drawers in your file cabinets. Features: Multi-Point Locking system. The Outside hinge bar is coupled with a red inner slide bar that interlocks with a specially designed locking lug hinge at every drawer opening when in the locked position. Our multiple locking system eliminates torque found in devices that lock at top and bottom only. Built-in spring-loaded hinge Swings bar clear of all openings. With Multi-lock you have clearance for unrestricted access to adjacent files locked or unlocked. No Storage- Accident or Damage. Multi-lock becomes an integral part of the file and swings clear of the door opening solving the problem of storing heavy dangerous bars.